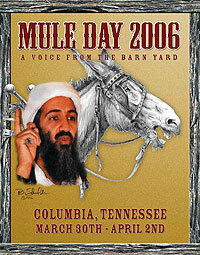 Tennessee believes Osama bin Laden will attack the Mule Day Parade. Indiana thinks its popcorn factory is a target. Blog entries have a different structure. They are typically short and are about something external to the blog posting itself, such as a news event. It’s not uncommon for a blogger to simply state, “I can’t believe this happened,” and then link to a news story. I can’t believe this happened!. There is more. The Homeland Security Department counts a petting zoo, a poker club, a popcorn factory and car dealerships as potential terrorist targets. See the complete list below. Indiana, which may be going for either a publicity stunt or a stupidity award, has submitted 8,591 “assets,” more than any other state. Why Al-Qa’ida or a similar terrorist group would strike a popcorn factory is unclear. Even stranger is the Mule Day Parade in Columbia, Tennessee. At least the parade has now made international news.